When Derek and I tell people we are moving in together – and will be redecorating ‘his place’ to become ‘our place’ along the way – they all give us the same advice: tackle one room at a time and pick the rooms to do first based on where you spend most of your time. We both love this advice. Focusing on one room at at time will stop both of us from feeling overwhelmed and redoing the rooms where we spend the most time first will really help in making this house feel like a home. With that in mind, our first focus will be the living room. Ok, let’s pretend we’re starting with a blank canvas. Wait a minute. You ain’t seen nothing yet. Here’s what I’m envisioning in the ‘Meghann was having fun with photoshop on her way to Miami this weekend‘ sort of way. Ok, picture it with me. First up – the couch. Derek and I found a couch replacement we both love from American Signature, but we’re hoping to find something similar on craigslist. If we are unable to locate something similar for a cheaper price by the time I move in, then we will happily pay for the new couch and chair & 1/2 that week. Problem: Derek loves the ‘black out’ functionality behind the blinds and these were a very recent purchase. How do I get the same functionality the blinds provide while giving them a little sprucing up? Would it be better to replace them with curtains? Should we keep them? When Derek moved in to his place last year, he spent a solid week painting the walls white. He pretty much burnt out on painting them and has flat out refused (in a very joking matter) to help with any painting. Completely understandable. Any new Tampa friends like to paint? Because, even without Derek’s help, I’m convince a spruce of color on the walls will really liven this place up. What color? And how do I paint the living room so it’s separated from the kitchen? Or do I paint the kitchen too? hmmm…. we’ll save my thoughts on wall art for another day. Also, we need a rug. I don’t even know where to begin on the rug! As far as items coming from my apartment, we will be incorporating the coffee table, end tables, and tv stand from my living room into our new living room. The coffee table is more for functionality than anything else because we both love its ability to rise up. I’m not against getting a new coffee table eventually, but it’s not high on the priority list by any means. What do you think? All comments and ideas are welcomed! Not sure if it’s your style, but I LOVE ZGallerie stuff. It can be pricey, but they have sales all the time. Lots of great home accents, fun wall art, etc. You can totally put curtains over the blinds – we have both in our living room and it works well. And you know I’ll be there to help you decorate! But only to paint if you get the type that John and Sherry used on Young House Love so I don’t inhale toxic fumes. Hehe. I would ditto this on the blinds. You could also do valances. Meghann, When I first got into home decorating, I never though I could paint one room and not carry it through to the next. But I ended up painting my kitchen light blue and leaving the connecting eat-in area a cream color and it looks awesome! It really separates the rooms! So that is a possibility! LOVE that coffee table, how cool! I don’t have any decorating tips for you at this time. You can also cover those couch pillows with a sham rather than having to buy brand new ones, which makes it a bit cheaper than replacing them entirely. I have the same problem with my blinds. I think they are ugly, but know I’m not staying in my condo forever and they are probably what the next buyer wants. As for painting – maybe paint the kitchen walls on the right and back a different color. That way, the kitchen has its own paint color? Or you could paint the while wall on the left a different color. So many options! Check out FLOR, they have fun rug options and are really versatile. That’s what I was going to suggest with the paint. Paint the living room and left wall (above the cabinets) the same color. That way it flows but you can still have a different color for the kitchen by either leaving the back and right walls white or painting them a different color. I loved the couch you picked out!!!!! Love that couch! I also agree that you can put curtains over blinds – I have them in my room and it would be wayyyy too cold without the curtains. can’t wait to see the transformation! you can definitely hang curtains over the blinds – a nice accent color would be nice. for the living room walls I would select a nice light color that complements (light tan, light blue, light green, etc. – whatever your preference is) the dark color of the sofa. you don’t want to use a dark color on the walls unless you want to make the room feel small and given the new sofa is dark there would be too much darkness. for the kitchen I would either paint the opposite walls a different color that complements the main wall (the one from the living room) or install trim from the counter to the ceiling to divide the two rooms and then paint the kitchen one color. Maybe just paint one of the walls? It would be a pop of color! Black out curtains. They have some at walmart that are fairly inexpensive and actually look nice. Then you have the same effect but something more decorative. Plus, they have a sound dampening effect as well which is just a bonus. That photoshop is amazing! It looks like such a guy’s apartment, as it should, but funny to see. Good luck re-visioning it! God everytime I see pictures of Derek’s couch I cringe, I’m sorry! Love the American Sig couch though. As far as the blinds go, why don’t you keep them, and get a shade to also hang and go over it. Great ideas! Decorating can be such a challenge, but fun at the same time. Painting two rooms that connect different colors can be tricky, but I have seen people divide the rooms by using a decorative “board” or column (like a chair rail) attached to the wall. You can also cover the vertical blinds if he insists on keeping them with floor length curtains that totally cover them. That way they’re still there (but you don’t have to look at them!). I wouldn’t do curtains over the blinds. I would just buy curtains with a black out liner. Sherwin Williams – Rice Grain is a nice neutral tan color. 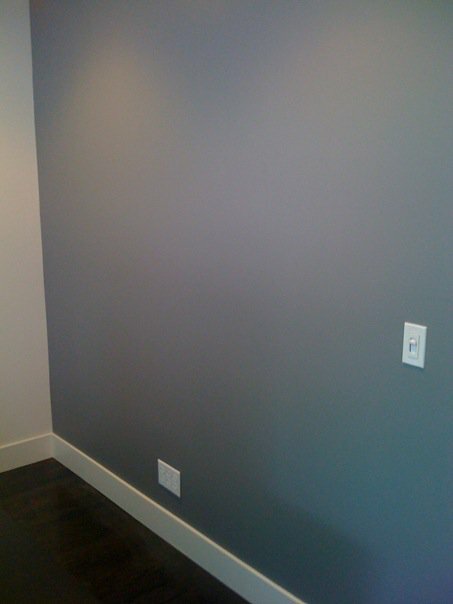 I also like Sherwin Williams – Argos for a neutral gray color. Tan would look better, if you go with the brown couch. Maybe some type of big clock in your living room or dining room? Maybe a big jute rug for the living room? You could try painting one wall an accent color and then painting the other walls a slightly lighter shade of the same color. That way there would be some connection between the two rooms, but it would still be different enough. When I first moved into my b/f (now fiancées house), we both watched a lot of HGTV! Some of their ideas are a little extreme, but all in all the decorating shows do have some great and inexpensive ideas! Also, Ikea and Home Goods are great stores for home stuff. I think someone spends too much time in Photoshop, lol. because of the open floor plan of the living room/kitchen, I would pick a light neutral color (like a light sage green or a yellow or beige) and paint the living room/dining room & kitchen all one color. I like the idea of putting a drape over the shade too. Maybe it could even extend from wall to wall somehow? Would the TV work on that smaller wall by the shade? I think instead of painting, since it’s such a pain, you could incorporate a punch of color with a dramatic drape and rug. For instance, since his place is pretty neutral and you are buying a brown couch you could go with a rich orange rug and drapes. You could also ad punches of color with artwork or shelving on the walls. Good luck in whatever you decide and I’ll look forward to pics! I’m really having fun with these pre-move posts. I LOVE decorating! I also recommend the black-out curtains that a previous poster mentioned. They’re a little more aesthetic than the blinds, and accomplish the same thing. (That being said, we got a ton of things from West Elm, and found the prices to overall be quite reasonable. Do you have a West Elm near you? I’d suggest checking it out). I would let his keep the vertical blinds. but just put curtains up over them. This way its a win win situation. I’m not a fan of vertical blinds at all, we have them in our house and I’m constantly debating if I want to spend a chunk on money on drapes or not. I really like a nice green shade for walls. Plus it would match your brown couch. You could keep one wall of the condo a beige color that matches the tone of the green like the long hallways way. That way it would break up the condo a little and give it some extra wow factor. My aunt and uncle have a similar living room connected directly to their kitchen area but I’m pretty sure they pained the living room a separate color. I’d say you could paint the living room right up til that cutout as you so wonderfully depicted with your black line. 🙂 As for that hallway area, maybe make that a contrast color wall. I’m not sure how you feel about having one color different than the others but it’s an idea. Otherwise I’d have that continue the living room color down the hallway. As for the blinds. They are fine but if you wanted some kind of curtain to liven things up, you could get valances. They’d add some color without you all having to get rid of the blinds that Derek likes. It could be a good compromise. Definitely put curtains up over the blinds. That should be fairly simple. 😀 I love that couch! I don’t think you need to paint the kitchen to separate it from the living room. Perhaps just paint one wall? Congrats on the move! Exciting 🙂 I’ve had the same problem with those white blinds before in apts. The last place I lived they covered a sliding door to the patio right in the middle of the living room. I got cheap tab curtains from Target and hung the rod relatively high above the top of the blinds (well not too high, the bottom of the curtains should hit the floor). This could resolve your problem of wanting curtains and him wanting to keep the blinds. Especially since he bought them himself. putting curtains over the vertical blinds may cover up the blinds but also the black out effect with still work. A beige is always a nice color for a living room and matches a lot! For rugs I’ve found that Lowe’s has a great selection at decent prices. Lots of sizes, patterns, and colors. Don’t try to be too matchy-matchy. For example, my couch is dark sage green with tan trim and my rug has greens and tans and browns in it but also blues. My husband (then boyfriend) had almost the EXACT same setup in his townhouse, right down to the ugly couch 🙂 We painted the wall that was shared with the living room all one color, and then painted the rest of the walls in the kitchen a different, but complimenting colors. Because the wall shared with the living room has so many cabinets on it, you hardly even see the color, and there wasnt a weird/awkward stopping point. Good luck! Doing a light gray would be nice too because then you can use accessories to add pops of color that you could easily change if you got tired of it. Maybe painting the lift-up wood table a dark color would be good too? Those are some ideas, I’d love to help in any way! They sell black-out curtain material for dirt cheap at fabric/craft stores. It’s even cheaper when you have a 40% off coupon. We’re renting our place right now and the living room came with sheer curtains. We hung the material behind the sheer curtains and it worked perfectly to block out the light. We did the same for our bedroom windows. We loved the panels that we picked out for the room, but they didn’t block out the light to our liking. Viola – craft store to the rescue! I really like grey/bluish grey walls for homes. I think it is a great “gender neutral” color, and pretty much goes with everything, but still looks polished and warm. It’s a color, but still retains neutral qualities for decorating and doesn’t close your space in. I mean this in the nicest way possible- those blinds have got to go! Get dark curtains to keep the black out and hang the rod “high&wide” a la younghouselove.com. Also, defintely paint! It makes a house much more homey and it’s such a noticeable change for not a lot of $$$. Get pillow covers from places like west elm, pottery barn and Ikea for way less than the cost of an actual pillow. Also, I think your rug should be a bit bigger than the one that is currently in the room. You have a lot of tile going on and I think a big rug will really ground the living room and define the space as separate from the kitchen/dining. Lots of good comments already. I agree about both the accent wall(s) and the curtains over the blinds. Or if you can force him(gingerly, of course) to part with the blinds there are good black-out curtain liners out there that you hang behind the pretty curtains. As far as picking a paint color, I’ve found the easiest thing to do is to buy a rug or curtains (something with a nice pattern and colors) and then choose the paint to match. Options with paint are endless but finding a decently priced rug that you like is a challenge so that’s where I usually start. However, my hubby is a GM at a furniture store — so here’s one little tip — call the furniture stores, ask for the managers,and find out if they have any floor models or know of any clearance furniture available. Sometimes you can get stuff for 50-75% off. Some of the clearance stuff can have small defects, but most of not noticable when arranged (we have a leather La-z-boy chair that’s discolored in the back). At my hubby’s store he gets a list of clearance inventory every month and orders based on what he thinks will sell. If he knows someone wants a particular item, he will order it and let them know. Good luck and have fun with all of your decisions! I am a newly wed, and went through moving into my husbands place. Much in the same situation, every thing was white. I couldnt handle it. If your going to be spending alot of time in the living room, i recommend going with a light, nice green. It gives the room a hint of color, as well as giving a great relaxing, modern factor. Then go to Michaels, dont forget a 40% off coupon they offer online and buy a huge canvas. Then you can pick and choose colors by painting a canvas with your favorite ‘accent’ colors. I went with red as accent. Then through in pillows, and a throw for the couch. It is the most personal, cheapest way to go! Since the ‘green’ fills in all the empty space, you can totally go with simple, clean modern wall art. I found a fabulous, sleek piece at Target for $20. Go to Costco if you decide to buy new window treatments for the living room (or future rooms). Hands-down, best pricing. Selection is awesome, too. TJ Maxx, Home Goods, and Target are great for rugs. Another idea is to go to a carpet store and ask what remnants they have in stock. The quality of carpet is better than that of a rug, and the prices are really reasonable. You should hang a mirror above the couch to bounce light and make the space look bigger. Hang a long skinny one that looks like it would go on the back of a door but put it the long way so it stretches the wall above the couch. I love the couch! I think a pop of color in the living room would be fun, just one wall or something. Good luck! I’m loving this series from you — I’m moving the first week of March and have to buy an entire apartment’s worth of furniture (slowly) and decorate. Can’t wait to get some tips and hopefully share some, too. I was at TJ Maxx the other day and saw some FANTASTIC rugs at a great price. I was tempted to buy one! I miss Abbie and I’m sure you do to. Caitlin recently posted..Welcome to the South Pole- OB! I like the accent wall idea – not as much painting involved! That new couch you picked out looks great! The pillows aren’t offensive to me, but if they’re not your style you could find some covers for them (or if you’re crafty, sew up your own). Too bad sectionals are so hard to find a nice slip cover for, due to their shape. A slip cover would be a cheap way to turn that into a dark brown couch. I agree that you need some color on the wall with the blinds. I understand the usefulness of being able to block out light, not to mention the fact that Derek just dropped some $$ on them. Maybe find some cheap curtains w/color to spice it up a bit. Sounds like a beverage center/hutch thing on that connecting wall would help break up the living room/kitchen too. What if you just did an accent wall in the living room! !/4 of the paint and still lots of color! You could even do the whole wall that connects the living room and kitchen perhaps? Just throwing some ideas out there. Urban Outfitters has some fun are rugs right now (might have just bought one myself!} Good luck! I’m sure it will be the perfect balance of both of you! My decorating style can only be described as early miscellaneous – nothing was bought with a vision in mind, but it works. Do you guys have Ikea down there? They have really good, cheap wall art that’s framed. And I’ve been baned from painting anything for the rest of my life from my husband – the last two projects I tackled had to be finished by professionals! – Figure out where you want to start and continue decorating from there. If you paint the walls, you may have to narrow down couch choices and vice versa. – I’d leave wall art for last and just fill in as you find things you like, don’t just buy something to buy it. – Painting is worth it and can be fun! You’ll probably want to go with lighter/neutral colors as the space isn’t huge. – Some website ideas: overstock.com for furniture / rugs, etc. Also really like Target for various decorating pieces. – Think about finding a company that rents furniture to people – my brother bought a full living room set that was previously rented out for really cheap! wow, you guys have quite a project ahead of you! i think you should definitely paint the walls. maybe a really subtle blue/grey? or a sand/tan? and i also vote for curtains over the blinds. that will definitely spruce up the room a lot! 🙂 i can’t wait to see the progress! An accent wall is nice. I think a piece of furniture would be best to help divide the kitchen from the living area, too. Love the couch! Looks very comfy. I love your photoshop playing:) I think you need some wall art- maybe some pictures of the two of you or something? I really like the new couch! Ok so I am not an interior decorator by any means but my roomate and I have lived together for 8 years (since 19 years old) from NC to PA and through relationships etc. Anyway, having a nice place has always been really important to both of us. So after alot of years of decorating and redecorating I can share a number of tips that have worked for me. To address a few of your goals, you can hang curtains right over those “fancy” blinds we have done this ourselves in our first apartment because we were not aloud to take the blinds down and it works and looks great. Secondly, the paint issue, make a line with tape and just stop painting there it really is that easy and you can do different color in the kitchen or just leave it as is. You could also consider buying a peice of molding and putting it on the wall where the kitching/living areas meet if you want a physical division. Now as far as decorating…. we have stuff from everywhere. The biggest thing I can say is do not force it you have to let the stuff find you almost. When we first lived together my biggest problem was my bedroom and i tried so hard to force it to look great and it never worked and i was unhappy and i wasted money. So remember it may be a slow process. In regards to art work i have used alot of my own photography as art or in groups of art. Also, my main art piece above my couch in the living room is made up of 6 medium sized canvases i painted designs on myself(and i am not a painter either). I picked 3 paint colors that matched my motif and alternated them throughout the different canvases. i saved alot of money doing my own art. with our furniture we have a few things that were expensive and a few peices that were gifts(couch) but we go to places like ikea, pier one, west elm, and some other local places. we have found some of these places(ikea) have “AS-IS” sections where we have purchased stuff we wanted for a steep discount bc it has a few small inperfections or just bc it was a floor model. We almost neeeever pay full price for anything and when we see somthing we like that is a bigger purchase(more that 20 bucks say) we think about it over night and consider if we could do it for cheaper, recreate ourselves, or just do with out. Also, if u find furniture on craigslist but it doesnt match in color , its nothing a little sand paper elbow grease and stain couldnt fix. Just be creative, patient, and have fun doing it and you will end up with your dream place! You sound like you know what you’re talking about. Love the single color painted canvases idea. you can definitely put curtains over blinds. or how about some taffeta/organza/that sort of flowy material over them, so they look pretty? or downlights at the top of the blinds so they look funky? oooh im getting into decorator mode! (keep in mind, erm, i’ve never actually decorated anything…)! oooh it is all going to look so wonderful! I really like the idea of an accent wall; it looks great and requires a lot less paint! My bedroom growing up had one purple wall (rest were white) and it always made me so happy! WOW that is overwhelming… and I must say, I’m in love with your coffee table. I would put curtains OVER the blinds.. functional and pretty. Totally agree, I always feel curtains over the blinds! You could totally hang curtains in front of the vertical blinds and have the best of both worlds (assuming you’re willing to have them open during the day). You’ll just (probably) have to get some extended mounts (I found some at Lowe’s for $5 each) so that the curtain rod will hang far enough out from the wall. We have a wall that extends from our living room into the kitchen and it’s one solid color. I thin it would be hard to stop painting in order to separate the rooms. Having it all one color leads to good flow from one room to the next. my parents used to have an open living/kitchen area, and they painted them two diff colors and simply put a one inch piece of whte trim as a divider where one color started and one ended. i know it SOUNDS weird, butit looekd good and everyone loved their house so i guess it turned out ok! maybe get curtains to put over the blinds? I agree with the other posters about adding color to the walls. I love your couch! Good choice! I wish I can give you other advice about the other stuff, but like I said before I’m not much of a decorator! :). My husband has more decorating style than I do! (really, in a good way!). I assumed you are keeping Derek’s dining/kitchen table set, but you’re getting alot of great input from everyone on what to do. Have fun! First off, that coffee table is awesome! I love that it raises. I agree with the curtains over the blinds idea. Also, when my finace and moved in together, I was always checking out thenest.com for tips and inspiration. check lowes for rugs! they have some great ones for decent prices. I have the exact same couches! They are sooooooooooooooo comfortable. But I did immediately get rid of the pillows (donated to Goodwill) and found cute pillows at Kohls. I think you’re probably having trouble because there are so many unknowns! How would you pick a rug without knowing what your couch looks like? Etc. Once you get some of the big things nailed down I think it will become easier. Do you have a color scheme you’re going for? Let me preface this comment with the fact that everything I know about home decorating (virtually nothing) comes from HGTV, which I have grown to love…and am watching right now 🙂 Since I can’t tackle everything, I feel passionately about the fact that the vertical blinds need to go. I hate having light come in my bedroom, but I found nice curtains that are cute and block out light. Target actually has/had a nice selection. Keep us posted with your decisions. We got a rug by going to a carpet store and having them finish off carpet. By doing it this way, we could pick the size we wanted and it was way cheaper than buying a large rug! A lot of carpet/rug places have remnants that they’ll turn into rugs for you for cheap so something to consider. My paint tip is to get a shoe box and paint the inside the color you think you want on the walls – it’s like making a mini room so you get a better sense for what the color will look like on a full wall. Also, you can hold the box in various places in your actual room to see if the lighting in the room will affect how the color looks. Just an idea to make sure you’re sure you’ll like the color you pick, since it’s sometimes hard to tell from those tiny swatches what it will look like on a big wall. http://www.selectblinds.com/ is amazing and has great deals! The blinds look amazing and high end. We used them for all new house. If you need for more then one room they sometimes do buy 3 get 1 free and 30% off! I suggest best neutral color ever “Earthy Cane” by Olympia – it is so rich and warms up any space. I also got really great blackout curtains from some website with improvement in title – they are not cheap but great quality! Good luck!! I would put curtains over the blinds! A really neat trick I learned from Young House Love is to put your curtain rod as close to the ceiling as possible, instead of even with the top of the window. It creates an illusion of length. Vertical blinds are terrible! Get blackout curtains asap! I would think of maybe painting only one wall, as an accent wall? If you paint the wall the sliding glass door is on, that would give you some color plus save time/money (less time, less paint) plus you wouldn’t have to worry about where to “end” the living room paint and begin the kitchen. I’m with all of the accent wall ideas but I would recommend painting the other walls a netural color other than white. I think the contrast between a colored wall and three white walls is just too harsh. A neutral tan, yellow, etc. would work well. I also saw you like the idea of painting the room(s) green. My parent’s kitchen and living room are basically one big room but they did 2 different shades of green. So you could do the kitchen and that long wall the sofa will sit on in a light green and the wall behind the television could be a darker green (if you don’t like the idea of all one color). Just an idea! Rooms To Go Outlet right off I-4 has some great rugs as well as other inexpensive furniture. You can also bargain with them. Goodluck and have a blast. I love decorating. I had the same dilemma with what color to paint my kitchen/living room because both are open rooms. I chose a base color (called crepe, stuck in my head!) and then chose a darker color and used it on certain walls to accent the base. It turned out really well! I hope you guys have fun decorating the place~! 1. I love that couch. 2. When painting, you must paint the entire long wall one color. It’s okay if your kitchen is two different colors – think of it as an accent wall. Our kitchen is green and we ha ve one long wall that is connected with the living room and that is our “accent wall”. The other walls are a macademia nut color. 3. I have no idea how one would spruce up those blinds. Personally, I”d take them down. 4. We got a really cheap rug from JC Penney – or IKEA has great prices too! I don’t care for blinds of any kind, so I feel your pain on the vertical ones. I bought this for one set of windows from Target (comes in other colors too): http://tinyurl.com/45gawzj. They have other ones that are made of thicker fabric or patterns too. I bought the ones from the link because they were cheap. Instead of hanging them normally, I draped them like so (link for just the style of draping, not the $$ drape itself): http://tinyurl.com/6xkt3gu (scarf valance). Works out great because we can still open and close the blinds without the drape getting in the way, and it makes the room look warmer. So the blinds are pretty heinous (sorry Derek, I can say that b/c my parents have had the same kind my entire life) but I understand that what he’s saying about the functionality of being able to “black out” the room in case you want to nap during the day or keep that hot florida sun outside where it belongs! I think what you should do is paint the wall with the front door and the wall with the sliding door a fun “pop” color, like orange, lime-sage green, deep purple, you get the idea, something brighter or a rich jewel tone that goes well with brown(think bright not faded vacation rental condo), then grab some throw pillows that match the walls from pier one or target (somewhere cheap but super cute). Then when you start getting your color palette going get a set of curtains for the windows so you aren’t stuck looking at the blinds first thing when you walk in. I like those big french poster prints, you can find them for pretty cheap and are cute for our age and would look great with brown and red, orange or green (even though im seeing youre not a huge fan of the green since you dont like the pillows.) By the table/bar area, I think you will want a hutch/dresser/something to put food/alcohol/catchall/picture framses. Also a table behind the couch (if the back of the longer couch is going to be the firsty thing you see- if its the chair and ahalf then it won’t matter) with candles and pictures would be nice so you aren’t staring at the back of a couch. With that couch, which is super cute p.s. you can go in alot of different directions with the neutral color. Some color on the walls and a throw rug. Good luck, I’m sure you’ll find a solution to painting the living room & kitchen. natalie @ http://healthybalancingact.blogspot.com/ recently posted..stuck in a rut a major challenge! What about putting curtains over the blinds, the curtains can be tied back to frame the area. You get some colour and Derek gets his blackout blinds. Hey! I live in Tampa (actually Lutz), is the condo near there? I’ve lived in enough apartments around here that I can usually recognize them from the inside, but that one is tricky. 🙂 I’m a runner and triathlete, let me know when you get to the area and maybe we can go for a run sometime! Go get several paint sample cards that you like. Tape them on the wall and look at them at different times of the day/nite to see them in the different lighting. Take the ones off the wall that you know you def don’t want. If it comes down to a couple of flavors and you can’t choose….you can always go buy the little sample paint cans and paint them on the wall and then choose. I’d tape off where the kitchen starts and paint it a contrasting color. I’d def put some curtains over the ugly blinds to soften up the look. …..another thought ~ you can spray paint and/or paint anything and give it a totally different look. Like your coffee table. Here are a few of my fav DIY blogs for some examples.